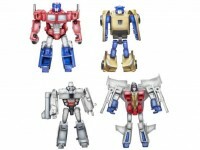 The highly sought after, but elusive Reveal the Shield G1 Legends are now available on Amazon.co.uk. Unfortunately they have yet to appear on Amazon.com. We're tripping over these in Northern Ireland. All the main supermarkets (Asda, Tesco, Sainsburys) all have loads of stock. TypeRProwl wrote: We're tripping over these in Northern Ireland. All the main supermarkets (Asda, Tesco, Sainsburys) all have loads of stock. Pretty much the same deal here in Canada. We've been swimming in RTS legends and voyagers for weeks, but god help us if we ever get the latest Generations deluxe waves. I saw a shelf loaded with them at either Target or Wal Mart in Fort Wayne a week or two ago. They do look cool but I rarely buy the small legends class type figures so I didn't pick any up. So I do know that at least some have made it to the States now. HoosierDaddy wrote: I saw a shelf loaded with them at either Target or Wal Mart in Fort Wayne a week or two ago. They do look cool but I rarely buy the small legends class type figures so I didn't pick any up. So I do know that at least some have made it to the States now. The other 5 are pretty awesome but only must-haves if you're into Legends. Well... maybe not Goldbug . I actually had Megatron in my hand and ended up putting him back on the peg when something else caught my attention. I should have grabbed one. I'm sure I'll see more in the future though. They just arrived in Hungary as well. Chaoslock wrote: They just arrived in Hungary as well. Is that a Lego M-Tron set from 1990? A bit incomplete yet, but yes, it is (missing a few panels, hoses, and a wing - they are allready en route).